Fairfax High School senior Lily Larsen is a fifth-generation Angeleno with deep roots in the neighborhood. So when it came time to consider colleges, she decided to stay close to home. “Larchmont has been a part of my family for decades,” Larsen proudly explains. Since the 1940s, Lily’s family, the Larsens, have owned one of the most beloved properties in Brookside, a house known as Brookledge, which once included a magic shop owned by magician Lloyd Thayer. As a young student, Lily was a part of the first class of Larchmont Charter School. 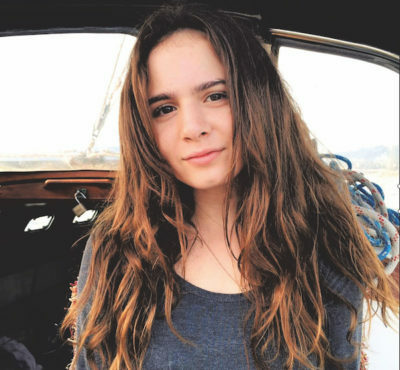 For high school, Lily first attended Los Angeles County High School for the Arts, and then transferred to Fairfax High School for her senior year to allow her more time to devote to her work as a community organizer and activist. Even at her young age, Lily has been busy with volunteer work to improve her community. She serves as the youth representative on the Mid City Neighborhood Council as well as a member of Mayor Garcetti’s Youth Council, and in recent months she has worked on the Department of Public Health’s “Bigger Choices” campaign. She also has performed “Still I Rise” by Maya Angelou at a Ted Talk event. Where to go after high school? For Lily, the answer is community college. The decision to stay local allows her to study and continue her community work, with family and friends nearby. “While attending Santa Monica College (SMC) and working, I will also be interning at a local advertising agency,” says Lily, who notes that any free time will go toward volunteering for her mother’s non-profit, “The Los Angeles Drama Club,” which teaches Shakespeare to local youth at a low cost. At SMC, Lily says she will study general education her first year, with electives in political science and pan-African studies. She hopes to transfer to a local four-year university from there. In the long term, Lily has her eyes set on a seat on the Los Angeles City Council, where she can continue her work as an advocate for the community that she loves. Marlborough School senior Sydney Gough spent last summer crisscrossing the country on a journey to find the right university. “As part of the college application process, my mom and I went on three huge college tours before my senior year,” explains Gough, who notes that the duo visited more than 20 universities nationwide. In the end, Sydney narrowed her favorite campuses down to three: Cornell, Northwestern and Colgate. Essays were written, applications submitted. Then, she waited. 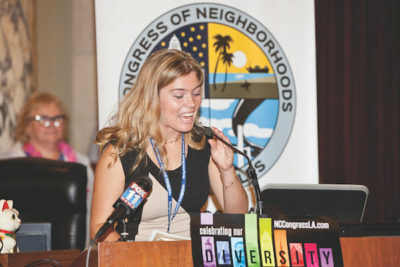 A lifelong Hancock Park resident, Sydney has been an active member of her school and her community. 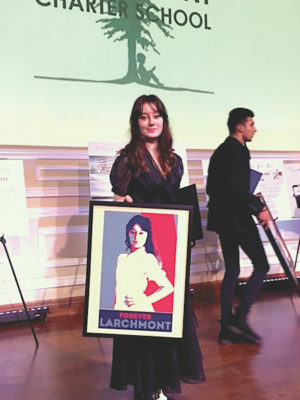 In addition to her schoolwork, she served as an editor and journalist for her school newspaper (“The Ultraviolet”) and for several years served as the Larchmont Chronicle school reporter for Marlborough. On the artistic side, Sydney studies voice lessons at the Colburn School, and she recently performed in a production of “Godspell” at the Hannon Theatre Company. Now, back to those college applications: After Sydney received acceptance letters from multiple schools, she had to finally pick one. “My decision was easy because Cornell was my first choice,” she explains. According to Sydney, three other girls from her class are attending Cornell. “I am actually going to be a roommate with one of them,” she says. It is often said: “If at first you don’t succeed, try, try again.” That is exactly the approach graduating senior Arum Butler-Sloss is taking toward his favorite university. The Pilgrim School senior started his college application process with a list of 14 schools, including five located in England. After some missing records forced him to drop the British schools, Arum narrowed his favorite options to three stateside: UC Berkeley, UCLA and Redlands University. “I was rejected by my top two colleges,” Arum admits. And even though his third choice sent him an acceptance letter, he says he couldn’t shake his strong desire to attend UC Berkeley. That’s when Arum decided to change his approach. 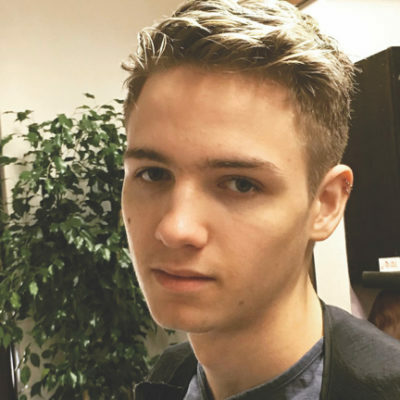 He identified San Francisco State University — located a short 45-minute drive from Berkeley — as a good place to attend his freshman year, then he plans to transfer. “San Francisco State is close to Berkeley. So I’m planning to transfer to UC Berkeley next year,” he says. According to Arum, a couple of other Pilgrim students were accepted to UC Berkeley: “I’m somewhat jealous of them, but it’s nice to know they’ll only be a short drive away when I’m at San Francisco State.” He also thanks Pilgrim college counselor LaToya Franklin for her help in navigating the application process. Arum hopes to study chemistry with the intent to work in the field of forensic science. For an aspiring writer and director, there are few places better to study arts and entertainment than Southern California. And that’s exactly where Emma Brandenburg plans to learn the business. The Larchmont Charter senior took “SAT Prep” classes every Sunday for several months to prepare for the college application process. On top of that, Emma says she “toured colleges, produced student films and wrote more essays than I could count,” all in her search. Emma knew that she wanted to attend an art school with a strong program in visual and performing arts, but the question was, which one? After months of research, she narrowed her top picks to the California Institute of the Arts (CalArts), ArtCenter College of Design and UCLA. With her top three picks identified, Emma was careful to choose the right school. She says that she took some classes at ArtCenter, participated in a summer film program at UCLA and spent a lot of time meeting people who work at CalArts. Soon, it was obvious to her where she should go. I had such a wonderful time writing for the Fairfax Column of the Larchmont Chronicle this year! Thank You Mr. Taylor and LC Readers!